The technology works by embedding a transponder into a card or tag; the transponder is encoded with basic information deciphered from the bar code of the product and can include additional details such as expiration date, lot number, and more. Signals generated from the transponder are communicated to and interpreted by a reader device that identifies and validates the details. Current RFID systems are small enough to fit inside a pocket, without compromising any of the information contained therein. North Mississippi Medical Center (NMMC), a 650-bed, level 2-trauma center, implemented RFID technology with IntelliGuard Intelligent Inventory Solutions to manage the restocking of crash cart trays. Intelliguard was deemed the best fit for NMMC due to the ease of product functionality and the professionalism and support offered. Prior to implementing RFID, pharmacy staff had to comb through disorganized crash cart drawers to determine which medications were assembled, had been consumed, or were nearing expiration. Under the new system, users encode small tags for each crash cart medication, which allows for location tracking of all available inventory. With IntelliGuard, the user places the tray of medications in the reader, and the reader compares the tags of the present medications to the assigned formulary and then issues a report of medications that need to be replenished or have expired. With this information, new medications are restocked and trays are updated quickly. Utilizing RFID to manage mobile inventory allows pharmacy staff to quickly locate a crash cart once it leaves the central pharmacy. Prompt removal of recalled medications within the main hospital or at off-site locations is feasible with a search of the specified lot number, improving the response time to address shortages and recalls. The precision of the system instills the pharmacy team with confidence that the medications are up-to-date and appropriately stocked. Initially, RFID was utilized solely for the replenishment and distribution of crash carts and emergency medication kits. After 6 months, pharmacists were spending less time restocking and managing the kits as the software provided an accurate account of inventory. Without excess time spent on crash carts, pharmacy was able to focus on improving other processes. In particular, we examined the high-demand area of the surgical suites, which utilized a manual process for restocking and checking anesthesia drug kits. Key priorities identified included proper tracking of narcotics, ensuring charge capture, and providing immediate dispensing. This led to the adoption of LVIS, or the Linked Visual Inventory System, a sister product of the IntelliGuard Kit and Tray Management System. LVIS provides real-time data and visualization of inventory within each cabinet. Standing at one meter high, LVIS is a portable cabinet that contains general anesthesia medications, including narcotics. Because the LVIS capabilities addressed the aforementioned priorities of the surgical areas, NMMC became the alpha-testing site for this technology. Primary users of the LVIS system are the pharmacy staff and certified registered nurse anesthetists (CRNAs). At the beginning of each patient case, the CRNA logs into the LVIS unit stationed in the operating room. The system tracks the removal of any medication during that case. 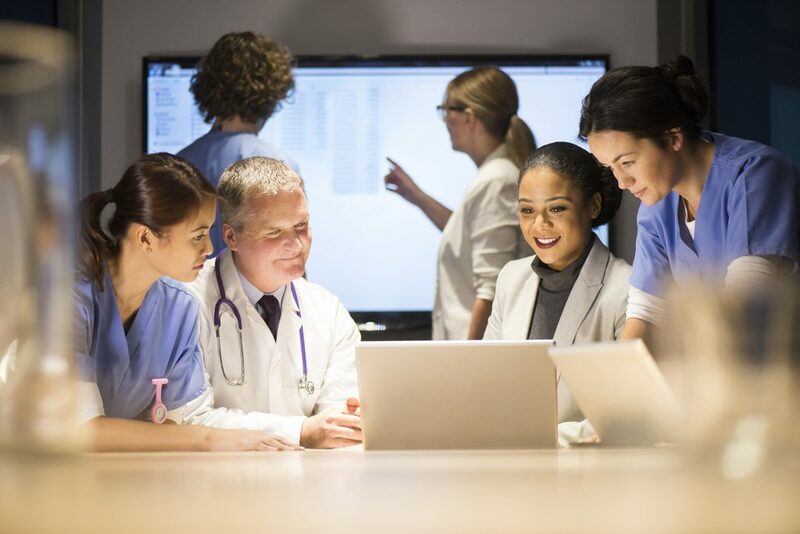 By capturing time-sensitive data, appropriate charge capture is performed without incorporating any patient-specific information, ensuring HIPAA compliance. While logged into LVIS, the CRNA has access to any medication without having to leave the patient’s side. Outside of the OR, medication removals and the cabinet’s inventory status are shown on a virtual dashboard that pharmacy personnel can monitor, making it easy to track controlled substances. The use of LVIS in the OR has demonstrated a reduction in medication waste, enhanced medication charting, increased regulatory compliance, and improved efficiency in replenishing cabinets. Future steps with RFID technology at NMMC include beta testing of the LVIS units in the catheterization laboratory and interventional radiology units. Whether examining emergency medication kits, locating a crash cart, or maintaining inventory levels in high-demand areas, RFID has the potential to improve medication safety and operational efficiency. Utilizing RFID within various hospital areas allows NMMC to reduce the risk of human error while increasing patient safety and improving workflow. Puckett F. Medication-management component of a point-of-care information system. Am J Health Syst Pharm. 1995 15;52(12):1305-1309. Johnson CL, Carlson RA, Tucker CL, et al. 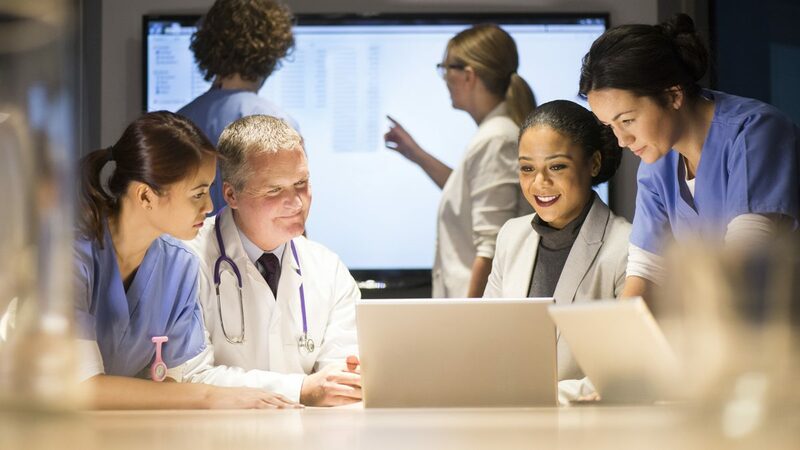 Using BCMA software to improve patient safety in veterans administration medical centers. J Healthc Inf Manag. 2002;16(1):46-51. 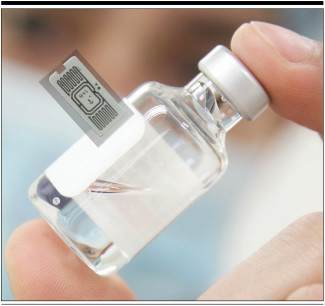 Sun PR, Wang BH, Wu, F. A new method to guard inpatient medication safety by the implementation of RFID. J Med Syst. 2008 Aug;32(4):327-332. Peris-Lopez P. Orfila A, Mitrokotsa A, et al. A comprehensive RFID solution to enhance inpatient medication safety. Int J Med Inform. 2011;80(1):13-24. doi: 10.1016/j.ijmedinf.2010.10.008. Lai CL, Chien SW, Chang LH, et al. 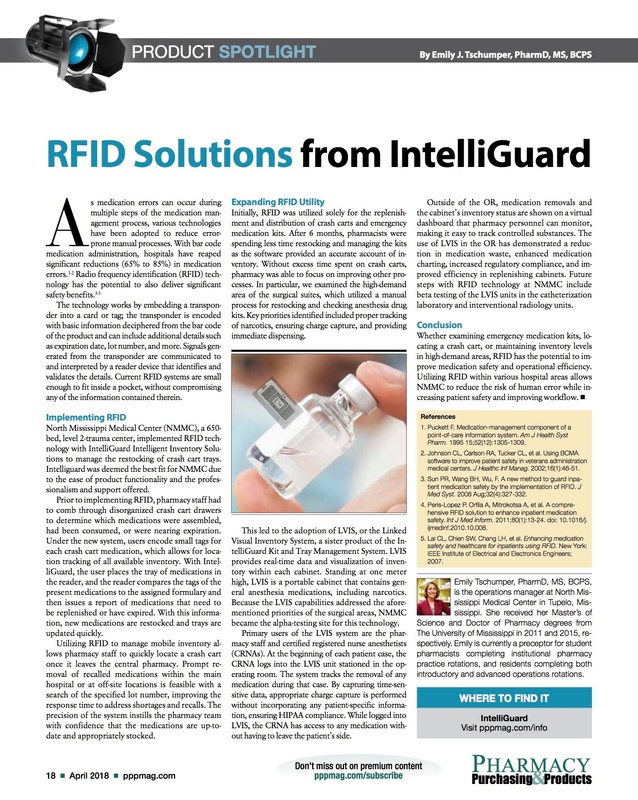 Enhancing medication safety and healthcare for inpatients using RFID. New York: IEEE Institute of Electrical and Electronics Engineers; 2007. Emily Tschumper, PharmD, MS, BCPS, is the operations manager at North Mississippi Medical Center in Tupelo, Mississippi. She received her Master’s of Science and Doctor of Pharmacy degrees from The University of Mississippi in 2011 and 2015, respectively. Emily is currently a preceptor for student pharmacists completing institutional pharmacy practice rotations, and residents completing both introductory and advanced operations rotations.